When comes to cooking this popular, Chinese stir-fry dish, the choice of beef is the key to success. The beef should be the first grade of beef fillet. Then you can be very sure to enjoy the tender, juicy, delicious beef seasoned with freshly grated black pepper. Some Chinese restaurants even serve this dish on a very hot iron plate, sizzling with rich black pepper sauce. Dice beef. Mix well with marinades. Dice onion and set aside. It’s better to stir fry the onion first. 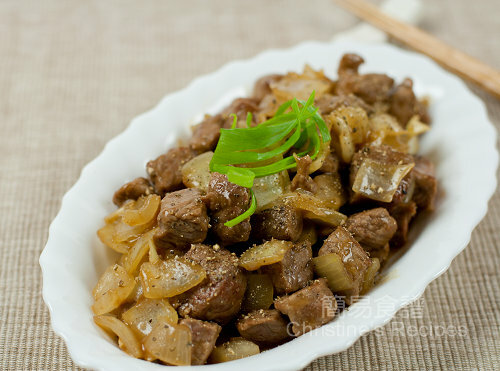 The flavour of onion infused in oil will enrich the taste of beef added afterward. Make sure to stir fry beef over high heat. By doing this, the surface of beef will be cooked quickly and meat juice is sealed inside. If the temperature of your wok is not high enough, you’ll loose the juice inside the beef cubes and the stir-fry dish becomes too runny otherwise. If your wok is not large enough, it’s better to dish up the stir-fried onion and set aside in order to make more room for your beef. When the beef is almost done, toss back the onion and cook briefly with beef. You have very good knife skills Christine and the beef dish looks absolutely delicious served ver a bowl of hot steaming rice! Your plating looks simple yet beautiful; it doesn't matter if that is an iron plate or not. I would go for second helping of rice whenever there is this dish on the table...nice! This dish must be delicious...peppery and all the big onion pieces. Would be really lovely with rice. Which part of the beef makes the best fillet? Am I asking a valid question? Is it tenderloin? Your stir-fry beef looks very professionally done, better than those in Chinese restaurants. This is terrific, so aromatic with black pepper! My version of this black pepper beef is adding oyster sauce as well as papain (enzym from papaya leaves) to tenderize the meat:) However some people like using baking soda. 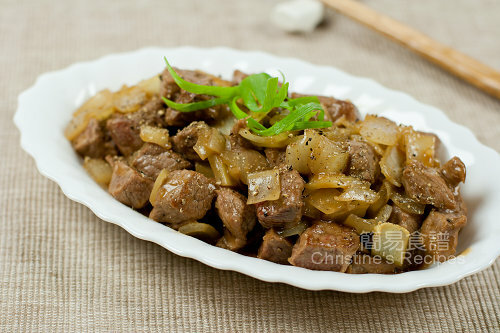 Gosh Christine - this recipe is my favourite at Chinese restaurants (well, actually almost everything you make is my favourite at Chinese restaurants!). - Thanks for sharing the recipe!! I used to just buy the lee kum kee to make it but was always worried about preservatives - good to know I don't need to use it now. This is one of my fave dishes to go with rice, and yours is beautifully done. I use sliced beef for mine but I'll try it with small beef chunks next time coz yours looks really good! Black pepper and beef are good companion. Yours look absolutely gorgeous! I've had this dish before and it was so tasty, I always wanted to make it at home but could never find a good recipe - you've saved me again! this looks super tasty..perfect for my hubby who loves peppery meat..
Agree with you! The choice of meat is very important for this. Love this with rice! Looks like a simple and easy dish! Perfect with a bowl of rice and a salad. This is one of our family's favourites,but it's hard to find Zhu Hou Sauce in Singapore,not even Lee Kum Kee sells it here. Woww Christine. But why am I shocked? Its another one of your fab recipes! Thanks. This was DELICIOUS! I added 1/2 TSP baking soda to the marinade to tenderize the beef. And I added a pat of butter to the oil after frying up the onions to give the beef even more richness. Yum Yum.